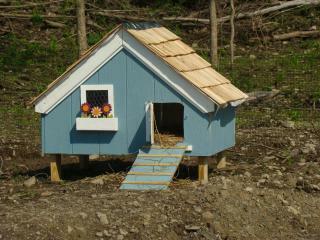 Our duck house, made from leftover scraps after making a pig shelter. I covered the floor inside with two layers of plastic wwe had lying around to give a waterproof and washable surface and so the treated wood wouldn't be indirect contact with the ducks. Floorplan is 3 ft x 4ft. The 'window' of chicken wire adds extra ventilation alond with the two traingular vents at the back. The window box was me getting carried away!!! 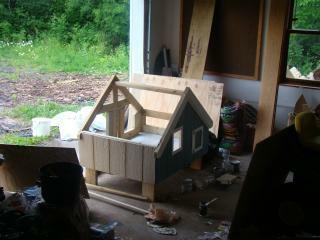 It currently holds our 4 Pekin ducks, Milly, Molly, Mandy & Donald. Would comfortably hold 6-8 Pekins, or more of a smaller breed. They all snuggle up together anyway. Doors at the back open for easy cleaning. The ducks love the little window as they can see you coming in the morning! 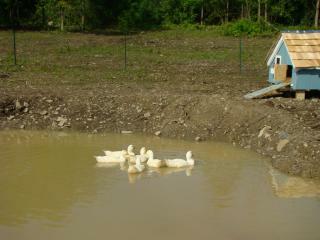 The house is by their duck pond which is 25ft x 25ft and fed by a small natural spring. The duck pond and a surrounding area are fenced in by 3 foot fencing on T-posts. Sadly inadequate to keep either predators out or the ducks in!!! We lost the two other Pekins last summer, but once we started shutting them in the house before dusk we haven't had any more problems. I think the enclosure is about 40 feet wide x 60 feet long, and seems plenty to keep them happy. Next project a shelter for their food bowl to keep the rain off!!!! Took two months of encouragement to get them to call it home.